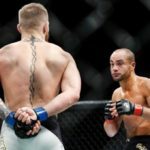 Coach Kavanagh says McGregor was holding his hands behind his back during his UFC 205 fight with Alvarez due to an injury. He says McGregor’s right index knuckle was hurt during his UFC 202 fight with Nate Diaz, and that was his way of protecting it in training, and also has the added advantage of fooling his opponent into trying to hit his head. He found that if he actually held his right hand behind his back, it kind of reminded him not to throw it as much. That’s why he started reaching back and actually grabbing his hand. It was almost like a mental note: take care of the right hand…If you put your hands down, an untrained person will try to swing at your head. It’s a base instinct — I want to punch the guy in the head. If you have a very high level of striking, boxing like Conor does, you understand rules like that. I don’t think others are kind of catching up to that level of skill.